All lovers are not poets but all poets are lovers, in one way or the other. If poetry is a love affair with life, which it is, then the poets must have a beloved. In some cases, poets have had more beloveds than one. This made them and their poetry amazingly curious and curiously amazing. To think of love and life is to think of Ghalib the lover, and Ghalib the beloved. He was not angelic in form and moving, nor a god in his apprehension but he surely was a piece of work, not very noble in reason but infinite in faculty. He was indeed Shakespeare’s ‘quintessence of dust’ who saw his love going to dust with emotional attachment and philosophical detachment. 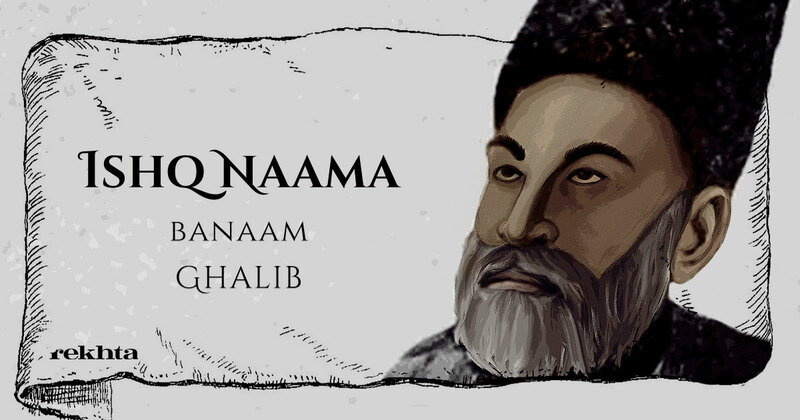 Although Ghalib configured his love metaphorically, it is not difficult to recognise faces that wear the veil of his poetry. While some of them are imaginary, others are as real as life itself. We know that he was married to Umrao Begum, the thirteen-year-old daughter of nawab Ilahi Bakhsh and niece of the nawab of Ferozepur Jhirka. We also know that he fathered seven children but none of them could survive beyond a few months. It has been often said that he was unhappy in his married life but there are evidences to show that he cared for Umrao Begum although he was bitter with her for many other reasons. 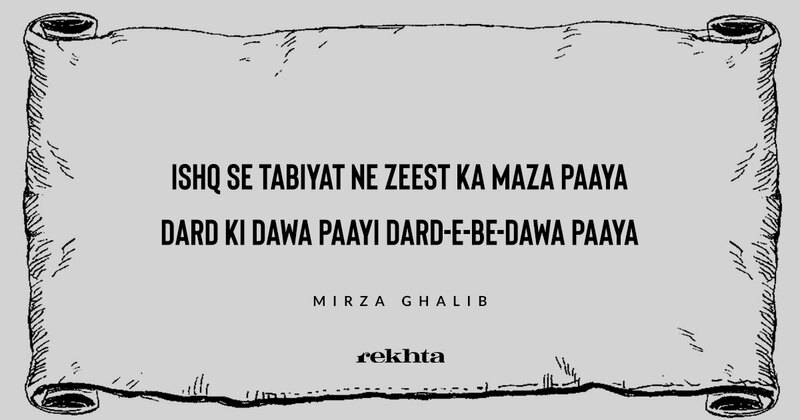 Indeed, Ghalib shared a richly ambiguous relationship with her knowing not how to fare forward. This is probably why he considered life as a term of imprisonment. Not finding the desired gratification in the institution of marriage, men are known to have sought their pleasures elsewhere. Is it a matter of infidelity, one wonders. 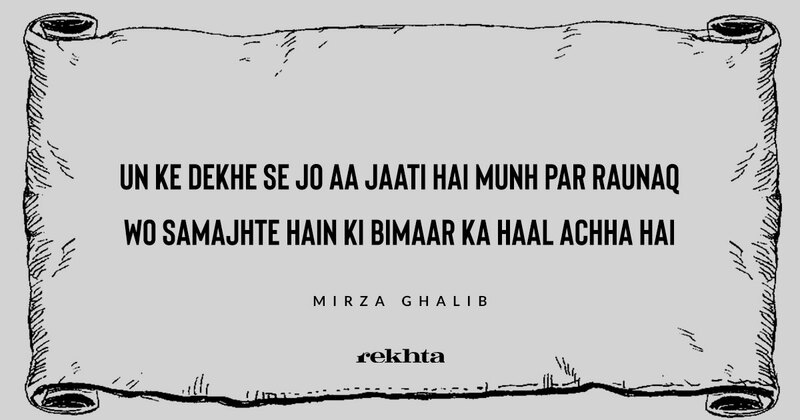 Some may say “yes” but Ghalib probably did not think so. And if he did, he did not how to resolve this dichotomy. So, whatever he did, he did only naturally and without much rationality behind them. There are two cases to mention here. He was enamoured by a coquettish singing girl but showed utmost poise in his relationship with her. Visiting the singing, or dancing girls, or even courtesans, was not supposed to be a demeaning act during those days. Indeed, men of high status visited them and enjoyed their company. One such girl whom Ghalib visited was known as Mughal Jaan and he was deeply fascinated by her. Unfortunately for Ghalib, she was also the cynosure of a good looking, suave and a contemporary poet of great merit called Hatim Ali Mehr who also admired her and visited her as Ghalib did. Mughal Jaan did not hide her dual sympathies and she shared his liking for her with Ghalib. Ghalib, being Ghalib, did not burn in anger and did not think of him as a rival. None of the three knew, however, that God had a different design for them. Mughal Jaan did not live long enough to let this plot thicken. She passed away too soon in her life. Mehr was deeply aggrieved as was Ghalib but Ghalib showed the highest kind of courtesy in writing a note to Mahr to assuage him and to share his grief with him. Ghalib’s love for Mughal Jaan was of a rare kind; he was romantically disposed towards her but was painfully aware that his sympathies would not go too far. Mughal Jaan was both–Ghalib’s fantasy and impossible reality. Human nature is also known to make peace with loss. 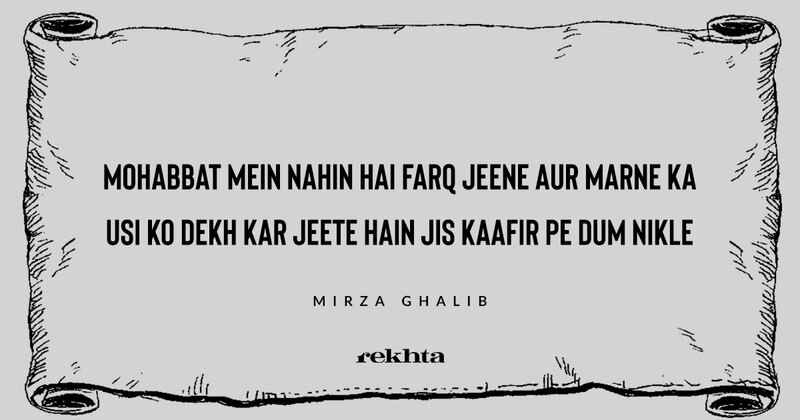 So did Ghalib. After Mughal Jaan, his love-life did not reach an end. This time he got into contact with a respectable lady from a respectable family. This is said to have continued secretly as his shers during the period bear him out. This affair did not last long. He found another beauteous being yet again who would give all he wanted—emotional solace and physical contact. This lady was an admirer of poetry and poets and Ghalib undoubtedly was the one whose companionship any poetry lover would pine for. She used to send her ghazals to him for his opinion. This brought both of them closer to each other although she was a minor poet and Ghalib would not have otherwise drawn closer to her but for his amorous nature. Ghalib referred to her as the “Turk lady” and enjoyed her special companionship the most. 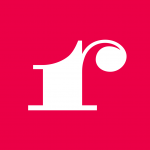 Their affair went on secretly and reached a stage where every excuse would only bring greater damage to their reputation than repair it. Fearing the onslaughts of the society for doing an inexcusable wrong, the lady chose to sacrifice her life. This put Ghalib to great agony. The incident might have lost its fire with time but it remained fresh in his imagination. A ghazal he wrote subsequently with the radeef of “hai hai” is more expressive than many other of his ghazals. 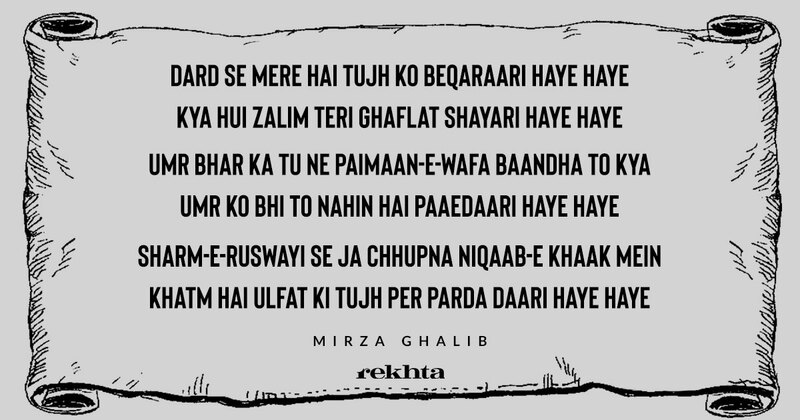 This ghazal is an epitaph for his “Turk lady”, as well as an act of love-sharing with her that shows Ghalib’s genuine respect for her. Unable to bear the loss, he fell ill and expressed his grief in the most poignant terms possible. 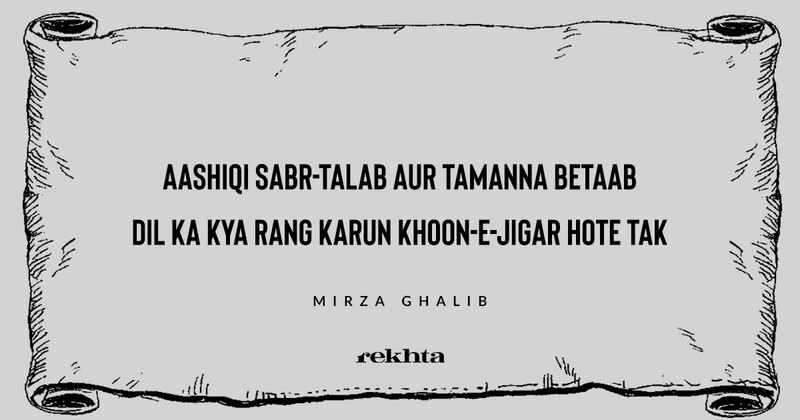 Incidentally, this also happens to be one the best known ghazals of Ghalib. Here is an audio clip of one of the famous ghazals of Ghalib sung by Malka Pukhraj (Video Credits: tauseefqau).